Even though I'm not much of a baker, there's something about a rainy afternoon that makes me want to bake. So today was a great time to try these Peanut Butter Cookies from Giada de Laurentiis' Weeknights with Giada Cookbook, and they did not disappoint. 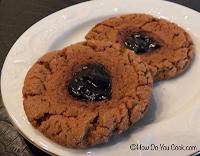 The dough has a nice peanut butter flavor with just a hint of cocoa, then you have the surprise of a blackberry jam center. Yum!! If I'm going to splurge and make cookies, I want them to be something this tasty. Preheat oven to 375 and line 2 baking sheets with parchment paper; set aside. In a medium bowl, combine the flour, cocoa, baking soda and salt; set aside. In a large mixing bowl, beat butter, peanut butter, 3/4 cup of sugar, and brown sugar, beating until smooth. Add egg and vanilla and mix, then add the dry ingredients and mix again until combined. Bake for 11 - 14 minutes until the cookies are crackled and slightly hardened. Cool on the sheets for 5 minutes then transfer to a wire rack to finish cooling. Makes about 18 - 20 cookies.